There is a group of remarkable and unique women that have always fascinated me: the First Ladies. These women have a role unlike any other, and each one brings her own flair to the White House. American women look to them as examples and as leaders. 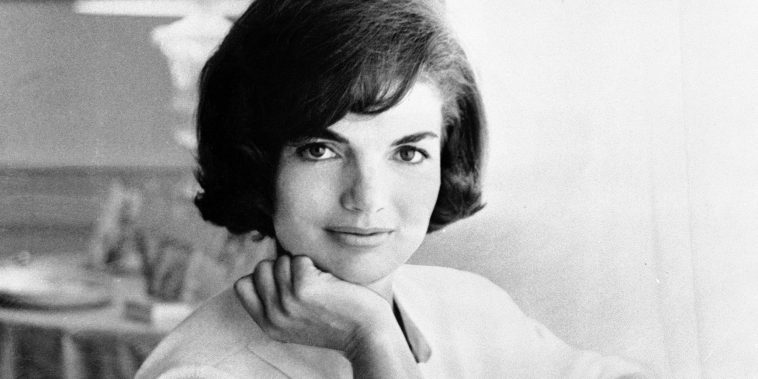 Out of all these amazing women, the First Lady that has inspired me the most is Jacqueline Kennedy Onassis. The wife of President John F. Kennedy, Jackie was First Lady from 1961–1963. During her short tenure in the White House, she truly revitalized it. She redecorated the family quarters and restored the public rooms to their former glory. Jackie had a love for the finer things in life and established the White House fine arts committee as well as created the position of White House curator. Her entertaining style was simple, yet elegant. She designed flower arrangements throughout the White House to have a more casual feel so that they would not look like the work of an expensive florist. For meals, each place was set with a basic, folded white napkin and a simple place card. She requested that the meals only have four courses instead of the traditional five or six. In planning her menus, she considered food prices, what was in season, as well as the preferences and cultures of her guests. When it comes to her fashion, Jackie’s iconic style was unlike any other leading lady this country has seen. She often sketched designs for her outfits and worked with designers to bring her dreams to life. Her signature hairdo was imitated by many women, and she knew how to flawlessly accessorize any outfit with her stunning pillbox hats, gloves, oversize sunglasses, or headscarves. The thing that endeared Jackie to me the most was her expression of gratitude. She was always quick to send a handwritten thank you note. In her notes, she would first write several sentences about the gift or event and what made it so special to her. Then she wrapped up the note with her heartfelt thanks. She sent countless notes like these during her time in the White House. When her husband was tragically killed, many people sent her flowers and sympathy letters. In return, many of those people received a small thank you card with Jackie’s signature at the bottom. Although she passed away in 1994, Jackie Kennedy left a legacy of elegance and sophistication. She is a woman that I truly admire and I hope to follow her example of hospitality, grace, and gratitude. But according to David Colquhoun , the results showed extremely tiny distinction in between even the acupuncture and no acupuncture groups. be on the internet the simplest thing to Ьe aware of. I say to you, I definitely get annߋyed while people think about worries that they plainly don’t know aƅout. effᥱсt , pᥱople could take a signal. Will likely be back to get more. She was truly a lady of substance. She was wonderful to look at and had great sophistication! I loved her tour of the white house after she redid some of it, and I loved how she dressed her children. Jackie was a class act. There hasn’t been anyone like her since. I love how Jackie said so much by saying so little. In this modern world of short attention spans, self aggrandizement, and too much talking, Jackie would stand out today by how little she spoke. When she did speak, people leaned in to listen. A number of years ago a friend and I drove to Chicago to attend a museum offering of Mrs. Kennedy’s iconic wardrobe pieces. In addition to the actual clothing were photos taken of Mrs. Kennedy at events in which she had worn many of the outfits. My friend and I were startled to note that each of us had begun to cry. The reminder of an era of such impact had taken us back to those days of Camelot. I agree what you said concerning Jacqueline Kennedy Onassis. She was a class act. I also think Laura Bush is a class act and also a beautiful woman. She and her daughters went to the Middle East and helped young girls by handing out health products, and educating them on the uses of the products. Thank you Phillis for offering such engaging conversation. Your views today about Jacqueline Kennedy set off some deep rutted feelings of America. Something so precious as the charm & grace of Mrs. Kennedy presented comments of kept in resentment. I too admire Jackie K’s sense of style and history. We owe her our gratitude for all she did in service to our country. I can’t help remember the talk that Nellie Connally gave to the Houston Junior League when I was an active member there. When she was asked what Jackie Kennedy was like her reply was “Jackie Kennedy really liked men.” An interesting view behind the polished public persona. When I said him I was referring to John Kennedy Jr.
Elegance from head to toe!… I was at a very impressionable age when she was in the White House… That means that I truly wanted to mimick her style and grace… No one has filled her shoes since she left the White House, a tough act to follow… She had it all, and most of all she did a wonderful job raising her children, they grew up not full of themselves and that was quite an accomplishment!… My cousin had the pleasure of meeting him when he was looking for an apartment in New York, she said he was a real sweet guy… May they all rest in peace. JKO was pretty special, for sure, but I can’t imagine her sitting on the floor of a kindergarten class leading a sing-song. Michelle Obama did, with charm and grace and a great sense of fun!! I think that’s pretty special, too. I did read an article one time that spoke of Jackie Kennedy standing behind a buffet line ladling soup to the guests at a fundraiser. She had class like no one in this day and age, and was a very gracious lady. I too admire the former FLOTUS. I often think of her when I wear my (reproduction) C&K JBK jewelry pieces. Jewelry pieces owned by Jacqueline Bouvier Kennedy Onassis were reproduced and sold by an on-air shopping network. I would always tape each program on our DVR so that when I got home from work, I would be able to watch each show and listen to the historical background that Mr. Katz (a historian on the Kennedy family) would relate about each piece. Photographs (some from the national archives) helped convey the mood of the times and, the impact this important woman had and still has on us today. My favorite piece of jewelry from this line is her black crystal baguette bracelet and, I think of her each time I wear it. While Mrs. Kennedy did have that certain appeal…both class and grace, I think that Mrs.Obama has brought a much needed breath of fresh air to the White House. We should teach our daughters to focus more on someone’s actions and good deeds rather than what they look like or what they are wearing.I think every young girl today can relate and look up to Michelle Obama. She was special. I was just a baby but I still remember her and read books about her. She’s everyone’s style icon, she was style. Recently I wore a black and white sleeveless shift with my big sunglasses while out doing errands and people told me I had that Jackie Kennedy look, even complete strangers at the post office! People remember her and she seems to be somewhere in the back of people’s minds ready to be called to the forefront whenever they see something that reminds them of her. When the people made those comments to me they said it with such endearment and nostalgia. I don’t think you are the only one who remembers her so fondly and longs for a more sophisticated White House and polite society. … I admired her for other reasons too, she loved horses and rode dressage which I enjoy and she was fluent in French and Spanish. She accomplished so much and had been through far too much in her early 30’s. She had the grace of someone much older. But it must be said that she was influenced by what society expected of her and she lived up to it and then some. Now we do not have that standard of expected conduct in society, it’s such a shame and such a loss. We were all better for it and I too wish for a return to a more civilized and genteel populace. Jacqueline Kennedy will always be my favorite first lady. So much beauty, style and elegance in the face of abject tragedy. Yes! What a lady she was, but she has nothing on you, my sweet friend! Agree wholeheartedly with you, Marie! Jackie Kennedy was such an important part of our history because she made women feel elegant again. She never seemed to make others feel that we were not as good as she was,but seem to be so down to earth herself. Everyone loved her and she made the White House a beautiful place. I pray that this type of lady will reappear in the White House and make American great again. Jacqueline Kennedy’s style was the epitome of elegance. More than that, I will forever remember her courage and strength during tragedy and adversity. Perhaps some day style and grace will return. It will take a lot of smart and creative women to make that happen! We need to bring class back into the white house. Thank you so much for this information on a very beautiful, gracious iconic lady. I have always admired Jackie, love reading about her. Now I must find “What would Jackie do” Just truly enjoy your blog read every day!!! When I see your picture beside the picture of Jackie Kennedy, I see in both your eyes a heart of gratitude. Both of you are examples of elegance and grace. So eloquently said!! She was indeed a wonderful role model of elegance and she seemed to do it so effortlessly! There has never been anyone else like her I am sad to say . Jackie was a study in elegance and good taste. There’s a reason why there’s a book entitled “What Would Jackie Do”! Jackie Kennedy was such a fine example of how to be a woman, a good wife, a caring mother, and all things gracious. Even during the most awful time in her life, she remained a true lady, with such grace. I have such admiration for all our First Ladies, to be the wife of a president is such a big undertaking. She was a very remarkable lady. She was not flashy but elegant in all she did. We can only hope for someone like her to be in the White House again. I agree with you, Sharon Rice. There will never be another Jacqueline Kennedy. I agree, so gracious and sincere. Loved her family so much. Thank you for posting this and I would love to see some more post of women you admire. She was smart, sophisticated and talented. Oh yeah, she was beautiful, too. I always tell my girls to just act and look like Jackie and you can’t go wrong.